I love to read books that are super good, but are not the ones that are being talked about all over Facebook and the Today show. The ones that someone recommends to you because they loved it, but whenever you ask anyone else if they’ve read it, they say no. I was busy reading The Giver and Animal Farm and getting ready to plan out those units before I went on maternity leave, so I put it on my To Read pile. Just before Alice was born, I picked it up and totally got hooked. The title character, A.J. Fikry, reminds me a lot of Sheldon from The Big Bang Theory, only literary instead of sciencey. He is the ornery, particular, owner of the only bookstore on Alice Island, Massachusetts. As a middle-aged widow (his beautiful, care-free wife died in a car accident), he talks to few and is rude to many. Then a series of strange things happen–an almost priceless Edgar Allen Poe piece is stolen, a “package” shows up in his store–that change his life. 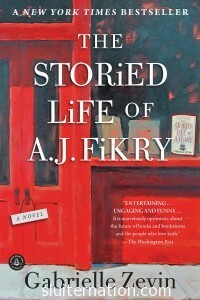 The book is separated into chapters with titles the same as short stories–which Fikry claims to prefer over novels–and a brief synopsis of what the short story is about. Literature nerds like myself will appreciate all the literary references and allusions not just from the chapter title pages, but throughout the entire novel. And as cliche as it sounds, I really can’t give away more of the plot because it would ruin the magic of it unfolding for you. It’s a quick read–especially if you do lean more toward the literary–but it’s both heartwarming and heartbreaking, if that is possible. There are times when you totally see what’s coming, but it’s not a bad thing. And then there are times when you are blindsided and you want it to be all cliche and happy. I found The Storied Life of A.J. Fikry to be the perfect read for helping me relax in the evenings as my csection date with Alice approached, and then for the evenings in the hospital before I went to sleep. It wasn’t too heavy, but it wasn’t just fluff either. Because this book straddled my time between pregnant with Alice and her first week home, I’ll always remember it fondly. Have you read this one? What are you reading right now? I’ve only heard good things about this book. My book club read it but I didn’t have time that month! I am reading Lavina. So far so good. Just started. You’re right in thinking that this isn’t one of those books everyone talks about, because I did not know about it. But I certainly want to read it now! Thank you for the review.